It has been very hot these last few weeks and I am so happy to have it cooler this week. I haven’t been around here, as in WordPress blogging, as much this year. Our business needed more of my attention this spring and then just as things were calming down in June I decided to get back to daily walks. By the time I cool off and eat it is time to get to work. I have been taking pictures while walking and today I am sharing two flower quilts I made with a cool app on my phone called Layout. Summer in Houston is generally very green and many flowering plants choose to rest. Here are a few that love the heat and humidity. From left to right starting at the top there is pink oleander, dark pink bougainvillea, pink Katy ruellia, confetti lantana. On the last row we start with an orange flower whose name I am not sure but the leaves reminded me of a Trumpet vine that has been trained as a patio tree. Next we have one of my favorites, a Tecoma stans ‘Gold Star’, (Esperanza, Yellow Bells). We finish with a big beautiful red hibiscus, they are really better suited to a more tropical climate but if protected during our freezes they can survive here. Starting to exercise at the beginning of summer might seem crazy but I figure it will help me appreciate the nice weather we have the rest of the year. I do walk around 8 am when the temperature and humidity are lowest. I am now up to walking between 2.5 and 3.5 miles per day. I have another fun app on my phone that measures my time and my distance. It also pauses so I can stop and take photos. Below are more from this morning’s walk down my shady street. Going left to right again we start with a red Turk’s cap that seeded itself in our garden, pink rain-lily that is in our front garden outside the fence. We got a late afternoon rain yesterday and up they shot and bloomed over night. Next we have a Mexican Fire Spike Bush “Red” – Odontonema strictum. The middle two are clusters of crape myrtle flowers. Every summer when things get a bit boring Houston bursts out in color with crape myrtle trees blooming all over town. They are one of my favorite trees along with fruit trees to plant in the right of ways. The last row we have a blue plumbago, an orange hamelia patens and a Golden Thryallis. Stay Cool and don’t forget to water your plants! 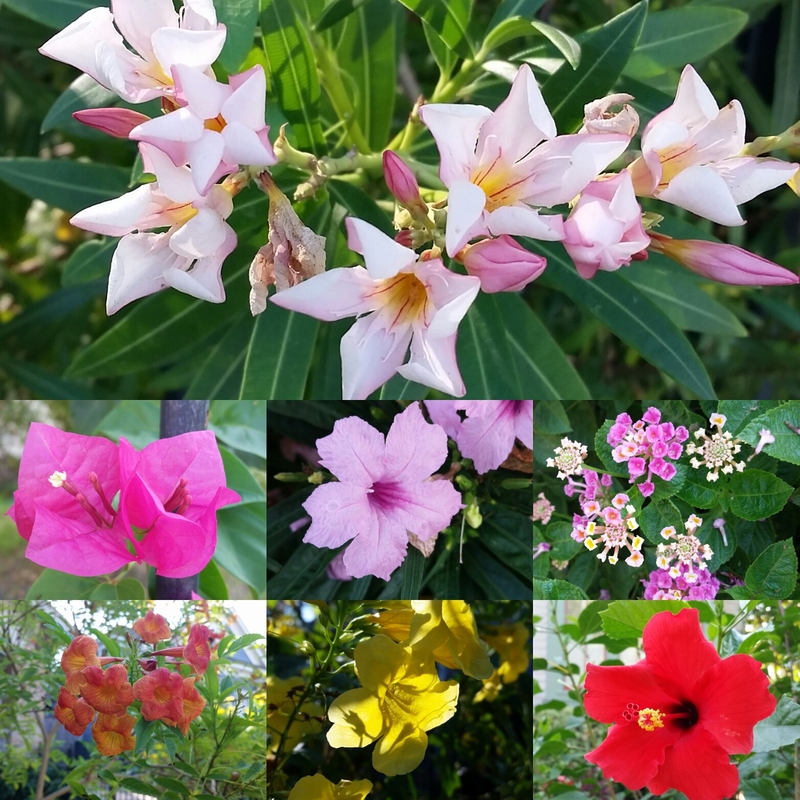 I love to see your tropical flowers, they bring back happy memories of holidays in my personal Paradise, Martinique. Your orange trumpet flowers look like Tecoma ‘ Orange Jubilee’. My Martiniquan friend had one in her garden. I have just bought a ‘ fitbit’ to measure steps etc, because like you I have taken up walking or cycling each day to try to get a bit fitter. I am happy they bring back good memories! I have several friends with ‘fitbits’ I have concidered getting one too! Similar to here. Thanks for sharing! I saw Mexican Fire Spike Bush “Red” in “White”, but from far away. I’m also exercising too, you’re not alone. I imgaine you do have most of these plants and they are probably happier there with milder winters. Happy you are exercising too! 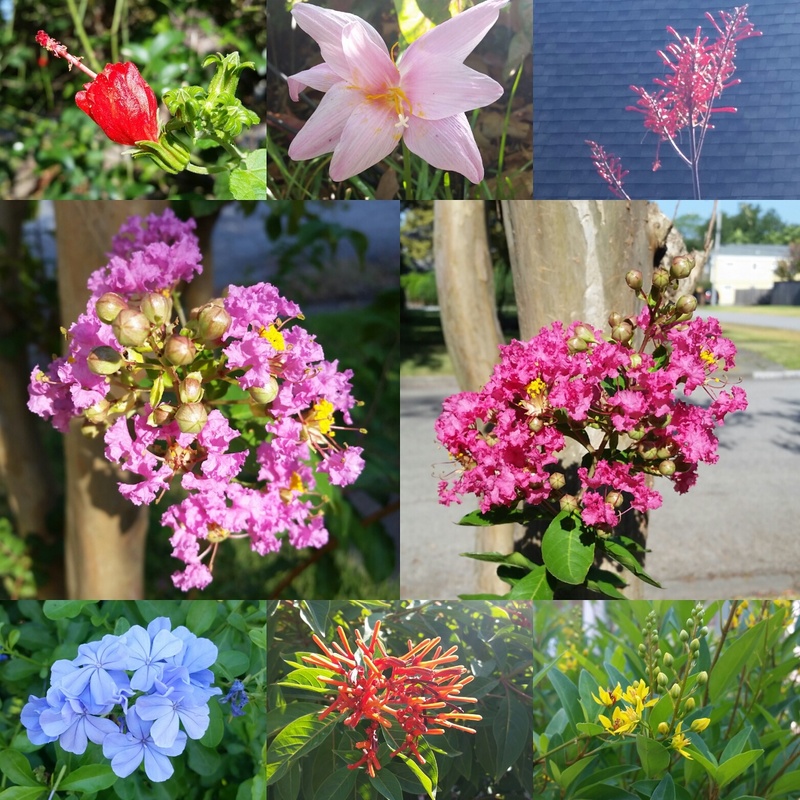 I was hoping to remember some flowers blooming in summer from my Houston years, for sure trumpet vines, lantana, canna, and Crape Myrtle. I enjoyed your list and photos. That is some variety of blooms…humidity does pay off there! I hear you on work, and having to get back to it after the smallest and hot break. Am reading up on aspects of Houston, hopefully I can visit late this year. Oh happy sigh. Love the colour and the lush. Thanks, Laurin! Your neighbors have many of the flowers which grace our summer containers and thrive in the heat we’re getting… except yours are happy down there year round! Beautiful colors and good for you for sticking with the exercise. I occasionally try to muster enthusiasm to walk early in the morning, but even in summer it’s so hot and humid. I know Houston is even more humid, so color me impressed by your discipline and mileage!